Peter Walker :: Has Anybody Seen Our Freedoms? Peter Walker has lived a remarkable life. The 76-year-old guitarist was a contemporary of Sandy Bull, Fred Neil, Karen Dalton, and Lowell George; a musical director for Timothy Leary’s famed “Celebrations;” a student of Ravi Shankar and Ali Akbar Khan. He recorded two LPs for Vanguard, Rainy Day Raga (1967) and Second poem to Kamela, Or Gypsies are Important (1969), and then retreated from the music business. Since contributing four new tracks to 2006’s A Raga for Peter Walker, a tribute album that paired new originals alongside tributes by Jack Rose, Thurston Moore, James Blackshaw, Steffen Bash-Junghans and others, Walker’s re-emerged. He’s released two new recordings of Spanish guitar, the byproduct of years of careful study with guitarists in the caves of Spain. In 2009, Tompkins Square released a previously unheard jam session recorded in Levon Helm’s barn, Long Lost Tapes: 1970. Has Anybody Seen Our Freedoms? would have been Walker’s third album. Recorded at Mercury Studios in ’69 or ’70, the tapes sat in Walker’s “vaults,” a converted bread truck, for decades before being assembled by Mark Linn of Delmore Recording Society, whose past work with John Fahey and Arthur Lee prepared him well for work with iconoclasts. Walker sent Linn on his way with two “pancake reels” of unreleased material, and the process of shaping the sessions into a cohesive album began. The recordings are all Walker. The backing bands which color his other recordings with jazz inflections and occasional bombast have been dispatched. Walker is alone at the mic with only his Gibson Hummingbird steel string, all he needed apparently to create this powerful work. 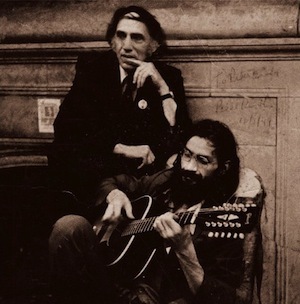 Walker is pictured on the cover with his close friend from those days, counter culture lawyer William Kunstler. The activist’s influence on Walker is discernable in the lyrics of Has Anybody Seen Our Freedoms? It’s not political, but Walker demonstrates a beautifully humanist streak. There are love songs, “Me and My Lady” and “Early in the Morning,” where he sings that there is “life to be lived.” There are road songs, like “Fifty Miles,” where Walker assures that “we’re almost there.” There is “Grey Morning Sun,” where he sings of those living off the grid, almost a eulogy for all the promises of the Sixties. Walker sings of people and their journeys, a wave of words that ebbs and flows like a rhythmic tide. Linn says that arranged and remastered, the recordings feel whole, “on par with the Vanguard albums.” He’s not wrong; Has Anybody Seen Our Freedom? is a complete statement from Walker, one that is calming but unrestrained. Walker’s rough edges are beautiful ones, and his dedication to freedom leaves the songs open for strange possibilities. Wow Tom, what a beautiful story.